So the thing is that MET claims that my car overstayed at their land, where it was 30 min allowed and it stayed 45. The driver did not know how long it was allowed and he was taking his time, so I was quite surpised with that PCN. He used jet wash and he thought it does not count to the time he stayed there... I'm trying to say that the signs are put in wrong places and there should be more time to use services and that the car wash are might not be within car park area. Please have a look and let me know what you think . Last edited by jblu; 15-09-2018 at 8:57 PM. 1. NtK does not meet PoFA 2012 requirement stated in paragraph 9(2)(f). 2. Grace Period: BPA Code of Practice – non-compliance. 3. No sufficient entrance signs and signs with terms and conditions in this car park are not prominent, clear or legible from all parking spaces. 4. No evidence of landowner authority - the operator is put to strict proof of full compliance with the BPA Code of Practice. On the NtK received there is no information fulfilling the above condition. “(1) The creditor has the right to recover any unpaid parking charges from the keeper of the vehicle. failure to include the warning mentioned in paragraph 9 (2) (f) in the NtK issued by MET Parking Services and the fact that that MET Parking Services has not shown that the individual who they are pursuing is in fact the driver who was liable for the charge, means that MET Parking Services have no lawful authority to pursue any parking charge from myself, as a registered keeper appellant. In cases with a keeper appellant, yet no POFA 'keeper liability' to rely upon, no presumption can be made about liability whatsoever. A vehicle can be driven by any person (with the consent of the owner) as long as the driver is insured. There is no dispute that the driver was entitled to drive the car and I can confirm that they were, but I have the right not to name that person. As only an evidenced driver can be told to pay and there is provided no evidence regarding who was driving, the parking charge cannot pursued without a valid NTK from myself as a keeper. The BPA’s Code of Practice (13) states that there are two grace periods: one at the start and one at the end. The BPA's Code of Practice points 13.2 and 13.4 clearly state that the Grace Period to enter and leave the car park should be a minimum of 10 minutes each. Whilst (13.2) and (13.4) do not apply in this case (it should be made clear - a contract was never entered in to), it is reasonable to suggest that the minimum of 10 minutes grace period each should apply. a)	The lack of sufficient entrance signs and specific terms and conditions signage throughout the car park in question (non-compliance with BPA Code of Practice 18.2 and 18.3) and the impact of that upon time taken to locate signage prior to entering into a contract. b)	The mentioned car park is small and always busy, and it was full at the moment of my car entering it, so it took long for the driver to find the right parking space. c)	The failure to place signage in places where it is safe to read them and to make signs visible from all parking spaces and legible once located (figures 2, 7 and 10). 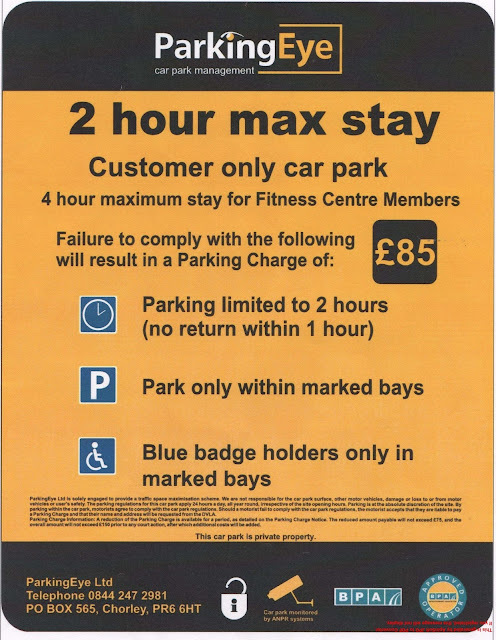 d)	The lengthiness of MET Parking Services signage (see figure 1 and real view on figures 2, 5, 7 and 8) in terms of word count and its font size, which appears to be too small, as discussed in the next point. Figure 2 and 3 show the view at the entrance and exit of the car park. Figure 4-6 show the entrance of the car wash area, figure 7 and 8 shows the side view of the car wash area entrance. Figure 9 shows car wash area exit. •	There are road markings separating the car wash area exit, but not entry and there are no signs with car park terms and conditions / signs are impossible to notice, therefore it is not clear if this is still car park area. •	There is no clear sign indicating the entrance/exit of the venue and no ground boundary marking indicating the start and end of the venue. Signs IN/OUT indicate direction not land borders. As a result, it is impossible for anyone to conclude that a controlled area is entered. Also, I believe that car park and car wash areas are separate as the signs do not explain what 'car park area' is and where the borders are. Moreover, when entering the car wash site there are no signs with any terms and conditions. The only sign with terms and conditions is placed within the wash area and in a place where it is impossible to notice it. On the day of claimed parking overstay, my car was using jet wash. It is not a surprise that the driver did not see the sign. Figures 4-8 clearly show that the sign is placed past the entry to car wash area, parallel to the road and after the turn to jet wash, which makes it impossible to read and even spot when using jet wash. There is a doubt whether the sign actually refers to car wash area or not. “Signs must be conspicuous and legible, and written in intelligible language, so that they are easy to see, read and understand” and “Signs should be readable and understandable at all times, including during the hours of darkness or at dusk if and when parking enforcement activity takes place at those times. This can be achieved in a variety of ways”. I believe the MET Parking Services car park signs (figures 1 and 2) are inadequate and illegible in a number of ways. They are not conspicuous, legible and written in intelligible language, so that they are easy to see, read and understand. It is, first of all, because of the amount of text that must be read. It clearly violates BPA’s Code of Practice (18.3) and appendix B. Secondly, they are poorly situated (for example only one sign and at the very bottom of BP shop, figures 10 and 11), easily unnoticeable (figure 5,6), causing confusion, sometimes in places where it is dangerous to read them (figure 2). The images in figures 2, 5, 6, 10, 11 clearly show that signs are unremarkable, not immediately obvious, lost between other signs and markings, parking terms and the wording is mostly illegible, being crowded and cluttered. It is indisputable that placing letters too close together in order to fit more information into a smaller space can drastically reduce the legibility of a sign, especially one which must be read before the action of parking and leaving the car. It cannot be reasonably assumed that a driver drove past and could read a legible sign, observed one upon entrance to the car park, nor parked near one. A similar POPLA appeal versus Euro Car Parks from September 2017 (car park: Kay Street, Bolton) was successful as the Assessor was not satisfied that adequate signage was placed throughout the site and therefore compliant with section 18.3 of the BPA Code of Practice. From the evidence shown above (figure ), the terms appear to be displayed inadequately, in letters no more than about half an inch high, approximately. I require MET Parking Services to strict prove the size of the wording on their signs and the size of the parking charge. “When designing an outdoor sign for your business keep in mind the readability of the letters. Letters always look smaller when mounted high onto an outdoor wall''. “(1) A trader must ensure that a written term of a consumer contract, or a consumer notice in writing, is transparent. This case, by comparison, as discussed above, does not demonstrate an example of the 'large lettering' and 'prominent signage' that impressed the Supreme Court Judges and swayed them into deciding that in the specific car park in the Beavis case alone, a contract and 'agreement on the charge' existed. When the driver arrived at the BP Stansted car park it was impossible to a read and understand the terms and conditions being imposed. Upon further research it is apparent that the initial entrance signs in the car park are poorly located (in unsafe places, not visible from all parking spaces [figures 10 and 11]) and the terms and conditions are illegible. There is no chance to see any sign when parking in one of the spaces close to the petrol station’s shop doors. As a result, the driver did not have a fair opportunity to read about any of the terms and conditions involving this charge. Where terms on a sign are not seen and the area is not clearly marked/signed with prominent terms, the driver has not consented to - and cannot have 'breached' - an unknown contract because there is no contract capable of being established. The driver in this case had not seen any signs) therefore, there was categorically no contract established between the driver and Met Parking Services as there can be no acceptance of an agreement if the other person is without knowledge of the offer. Having considered the MET Parking Services signage against the requirements of Section 18 of the BPA Code of Practice and POFA 2012, I conclude that the signage at the site is insufficient to bring the parking charge to the attention of drivers as the fine is illegible in photographs and does not appear at all at the entry to the site. I put MET Parking Services to strict proof of where the car was parked and how their signs appeared on the date and time of claimed contravention from the driver's perspective. Also, I require MET Parking Services, instead of showing the closed-up, computer generated image of their sign, to show how the entrance and other signs appear from a driver's perspective and where all those signs are placed. I am certain that full terms simply cannot be read from a car before parking and the computer generated images with signage terms, sent by MET, will not be sufficient to disprove this. As MET Parking Services do not have proprietary interest in the land, I require that they produce an unredacted copy of the contract with the landowner. The contract and any 'site agreement' or 'User Manual' setting out details including exemptions - such as any 'genuine customer' or 'genuine resident' exemptions or any site occupier's 'right of veto' charge cancellation rights – is key evidence to define what this operator is authorised to do and any circumstances where the landowner/firms on site in fact have a right to cancellation of a charge. It cannot be assumed, just because an agent is contracted to merely put some signs up and issue Parking Charge Notices, that the agent is also authorised to make contracts with all or any category of visiting drivers and/or to enforce the charge in court in their own name (legal action regarding land use disputes generally being a matter for a landowner only). Witness statements are not sound evidence of the above, often being pre-signed, generic documents not even identifying the case in hand or even the site rules. A witness statement might in some cases be accepted by POPLA but in this case I suggest it is unlikely to sufficiently evidence the definition of the services provided by each party to the agreement. “7.2 If the operator wishes to take legal action on any outstanding parking charges, they must ensure that they have the written authority of the landowner (or their appointed agent) prior to legal action being taken. Last edited by jblu; 18-09-2018 at 5:58 PM. 5. Vehicle Images contained in PCN: BPA Code of Practice – non-compliance. "When issuing a parking charge notice you may use photographs as evidence that a vehicle was parked in an unauthorized way. The photographs must refer to and confirm the incident which you claim was unauthorized. A date and time stamp should be included on the photograph. All photographs used for evidence should be clear and legible and must not be retouched or digitally altered." The PCN in question contains two images with vehicle and close-up license plate underneath. The time and date stamp and license plate are not part of the images, but were inserted, thus photographs were manipulated. I require MET Parking Services to present the original images, with the exact time and date stamp, showing the vehicle is actually parked within the stated area, rather than just passing by. Given the unbounded nature of the venue, failure to present such evidence would confirm the MET parking services collect random license plates of all vehicles passing by through using APRN and aiming to extract penalty from innocent people. shows that the private parking industry is unregulated and does not have any accountability. Various cases show the industry’s priority is maximizing the penalty received from the motorist without due regard to the integrity of the evidence. Private parking operators are financially incentivized not to use the original image as evidence, but putting partial evidence together to generate a case biased towards generating a penalty fee. Based on the fact above, I require MET Parking Services to produce strong evidence, audited by qualified third party, to prove that its process is not biased to suit its financial objective. 6. The ANPR system is inaccurate and not reliable. MET states the images and time stamps are collected by its ANPR camera system installed on site. In terms of the technology of the ANPR cameras themselves, they are not fully reliable nor accurate. The British Parking Association does not audit the ANPR systems in use by parking operators, and the BPA has no possibility to ensure that the systems are in good working order or that the data collected is accurate. Independent research has not found that the technology is 'generally accurate' or proportionate, or reliable at all, and this is one of the reasons why Councils are banned from using it in car parks. "You were concerned about a comment from the POPLA assessor who determined your case which said: "In terms of the technology of the cameras themselves, the British Parking Association audits the camera systems in use by parking operators in order to ensure that they are in good working order and that the data collected is accurate" You believe that this statement may have been a contributory factor to the POPLA decision going against you, and required answers to a number of questions from us. This is not a statement that I have seen POPLA use before and therefore I queried it with them, as we do not conduct the sort of assessments that the Assessor alludes to”. ''As with all new technology, there are issues associated with its use'' and they specifically mention the flaw of assuming that 'drive in, drive out' events are parking events. They state that: ''Reputable operators tend not to uphold charge certificates issued in this manner''. As POPLA can see from that, excessive use of ANPR is in fact, illegal, and no-one audits it except for the ICO when the public, or groups, make complaints. Additionally, under paragraph 21.3 of the BPA Code of Practice, parking companies are required to ensure ANPR equipment is maintained and is in correct working order. I require MET Parking Services to provide records with the location of the cameras used in this instance, together dates and times of when the equipment was checked, calibrated, maintained and synchronised with the timer which stamps the photo images to ensure the accuracy of the ANPR images. As the parking charge is founded entirely on 2 photos of the vehicle number plate allegedly entering and leaving the car park at specific times (not shown within the photographic images), it is vital that MET Parking Services produces evidence in response to these points. Last edited by jblu; 18-09-2018 at 6:00 PM. Have you already blabbed in the appeal about who was driving? Hope not. If not, where is the first point if this is at an airport, ''no keeper liability'' like in any APCOA Airport one? Because APCOA Airport ones are similar IF MET have not used the POFA. You need to NOW urgently (really, NOW) edit your first post, if you wish to protect the driver ID. See what I mean, read what you said there - EDIT it profusely unless you already threw away the winning point the keeper had, in your first appeal? Last edited by Coupon-mad; 15-09-2018 at 9:34 PM. If not, where is the first point if this is at an airport, ''no keep liability'' like in any APCOA Airport one? 5,200+ word copy and dump appeal, referencing both MET and Smart Parking, yet falling at the first hurdle with an 'I, I, I ......'. So as ever, it hinges on whether MET's NTK is a POFA-compliant one or not, which is explained in the NEWBIES thread where there is a link to Schedule4 for people to check for themselves (it is fairly easy...). I was thinking this might not be a POFA one, so, you tell us (without asking us to tell you)! And please don't just tell us what date it arrived, it's not just about the date. I just told you where to read Schedule 4. We help people who help themselves and I would have expected ANY newbie to have compared their NTK to the very very easy to read, not complicated, para 9 requirements. Please read it in the morning after a good night's sleep. This is not hard. Okay, so it seems that the NtK is POFA compliant, but POFA says about 'the period of parking to which the notice relates' while NtK states the period of remaining at the car park, which are two different things because a car does need to be parked while staying somewhere, right? Does this count as POFA breach or something else? No it doesn't count; it's OK for a postal ANPR PCN not to evidence parking time. Not a silly question at all though and we've been asked about that a lot. Are you confirming that the PCN DOES have the 9(2)f warning to the registered keeper? Can they fine for just staying and not parking then? That's not fair, is it legal? Do NOT follow any other links on the Parking Prankster's website, only the case law. Disappointingly, PP continues to retain dodgy links too that have (reportedly, and I can show the threads if this is queried) caused posters here to lose money. Yes but you know that's two different sections of paragraph 9. Are you saying with certainty that 9(2)f - usually a lower paragraph than the one you said - is missing? If it's not there, that's why you appealed as keeper in the first place! How do people seem to miss the WINNING point ''no keeper liability'' off at POPLA stage and fiddle about with other things like 'no period of parking' and completely miss checking for the really obvious - and clearly vital mandatory wording - the 9(2)(f) keeper liability warning? Yes, 9(2)f, 28 days warning definetely missing. 5. NtK does not meet PoFA 2012 requirement stated in paragraph 9(2)(f). “(1)The creditor has the right to recover any unpaid parking charges from the keeper of the vehicle. And put #5 as your first point; you will win on no keeper liability hands down. I believe this my final version. Or is there anthing else that needs to be improved? one more question, do I need to attach that NtK to my appeal, as a proof?